Opening as the flagship for Centenary of Federation celebrations, the National Museum is the first in the country devoted to the stories of Australia and Australians, exploring the key issues, events and people that have shaped and influenced our nation. Rare and fascinating objects which illustrate the complex origins of the Australian continent and nation have been collected for the past 20 years and are the focus for the Museum's wide range of stoires and exhibitions. State of the art technology and exhibition design present these stories in an exciting and inventive manner, including the use of muti-media, live performances and hands-on activities, to appeal to a wide range of audiences. There are three themes: Land, Nation, People. Free, some charges apply for temporary exhibitions. Guided tours, education programs, lectures, children's activities, broadcast studio, venue facilities, Cuiseum café, Backyard café, Axis restaurant, Museum shop. 170,000 objects. There are five permanent exhibitions: Nation: Symbols of Australia; Eternity: stories form the Emotional Heart of Australia; Tangled Destinies: Land and People in Australia; Horizons: the Peopling of Australia since 1788 and the First Australians Gallery. Pigment on board. 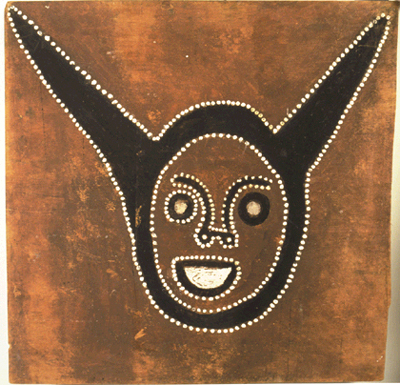 This painting depicts Darrarru (Devil Devil) from the Kurirr-Kurrirrceremonial cycle. 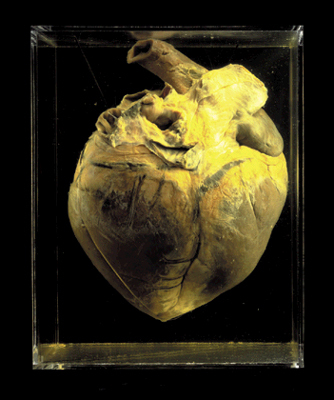 Phar Lap's abnormally large heart, weighing 6.2 kilograms (the average for a horse is 4.0 kilograms), is a popular object in the National Historical Collection - testimony to the great affection in which Phar Lap was, and still is, held by the Australian people. The heart is on display in the Nation: Symbols of Australia exhibition. 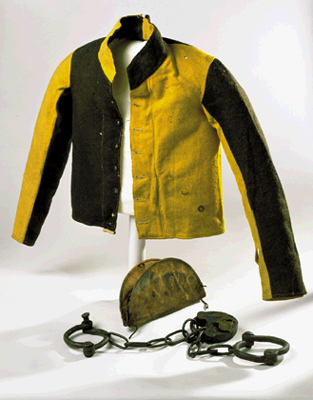 An Imperial particolored black and yellow wool convict jacket. Convicts typically wore basic clothing such as this 1860s jacket from Tasmania when building roads and bridges. It is now on show in Horizons: The Peopling of Australia since 1788 as a symbol of our convict past. This striking three-berth caravan was built by the Propert Trailway Products Company of Sydney in 1956, primarily for promotional work. While the company did make a few of these caravans for sale, it concentrated primarily on making folding models, particularly custom-built ones. 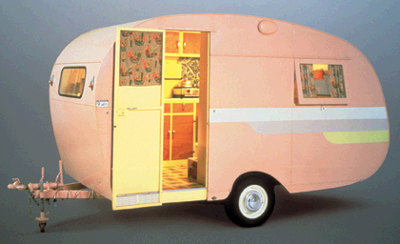 This caravan stands in the Nation exhibition as a nostalgic reminder of Australia'a 1950's obsession with caravanning. 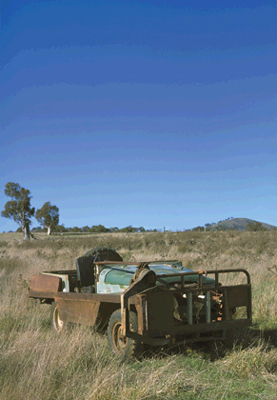 Water buffalo were introduced into the Northern Territory from Timor in the 1820's. Although wild buffalo hunting was a thriving enterprise by the 1880's, the industry collapsed a century later when most of the feral herds were wiped out in a campaign to elimate the diseases that threatened cattle. The 'Tangled Destinies' exhibition includes this 'buff catcher' owned by Tommy Fawcett - complete with bionic arm for catching buffalo - and also features breathtaking footage of the catcher in action.